To be sure, there are some seeming similarities between China’s “one belt, one road” initiative with the U.S. Marshall plan, with the main one being that both plans aim at exporting their country’s capital, technology, and capacity to others who need them badly. But there are some major differences between China’s “one belt, one road” initiative and the Marshall Plan, which have not received adequate attention from many analysts. More specifically, China’s Silk Road vision is different from the Marshall Plan in motivation, challenges, and potential impact. The first major difference lies in China’s main motivation behind the “one belt, one road” initiative. China does not seek to become a hegemon in Asia and beyond. 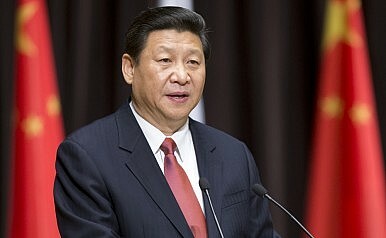 Instead, by helping other countries develop, China hopes to achieve a “win-win” situation between it and other partners. As such, China has openly called for other countries to join China’s “one belt, one road” initiative, even if sometimes it means that other countries might free ride on China. Unlike the Marshall Plan, which excluded communist countries, China’s “one belt, one road” initiative is open to all countries who are interested in development, regardless of their regime types. The second major difference is that China’s “one belt, one road” initiative faces far more challenges than the U.S. Marshall Plan. The United States was already a global hegemon after winning the Second World War, thus enabling it to push the Marshall Plan without much resistance from Europe. Also, the U.S. and its European allies shared many values and beliefs, which made the Marshall Plan much easier to implement. Today, China is still a rising power and a developing power, facing tremendous security, political, social, and economic challenges around the globe. Distrust in China is also a serious problem in many countries, particularly in the United States, that might view China’s “one belt, one road” initiative as a direct challenge to U.S. dominance in Asia and beyond. What all this means is that China will face tremendous political challenges even if its intentions are benign. For example, the Mexican government just abruptly canceled a high-speed railway contract that was awarded to a group of Chinese companies just a few days ago. Whatever the real reason behind this abrupt cancellation, one thing is clear: China needs to work harder to win the support and trust of other countries. The third major difference is that China’s “one belt, one road” initiative is far more ambitious than the Marshall Plan. China’s initiative aims at the whole world, and thus could have a greater global impact. According to some estimates, the total value of China’s “one belt, one road” initiative could reach $21 trillion. If successful, China could extend the “one belt, one road” initiative to the whole world as long as other countries are interested in development and trading with China. In this sense, China’s ultimate goal is not only to realize the Chinese dream, but also the APEC dream and the world dream. It might sound too ambitious to many, but China seems to understand the key desire of many developing countries: they want development first and they want development without the political strings imposed by the West. Of course, there is no guarantee that China’s “one belt, one road” initiative will be an easy success due to a variety of geostrategic factors. Some countries might see this as China’s ambition toward global superpowerdom and decide to block it. Other countries might fear becoming over-reliant on China’s trade and investment and thus only cooperate with China half-heartedly. Still others might not like China’s values and refuse to join China’s initiative even though there are benefits for them as well. All these potential obstacles should be taken seriously by Chinese leaders and more work needs to be done for China to convince others that its “one belt, one road” initiative is indeed aimed at achieving a “win-win” outcome for everyone. The road to eventual success might be long and bumpy, but China certainly, so far, has made all the right choices.